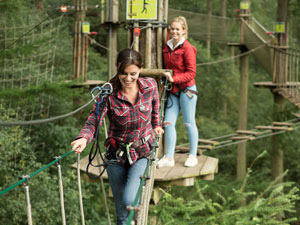 Go Ape is the UK’s No.1 Forest Adventure. We’ll brief you for safety before you fly down our zip-wires, leap off our Tarzan Swing and tackle our crossings whilst enjoying some of Britain’s most breathtaking scenery. Award-winning outdoor adventure activities for all the family. 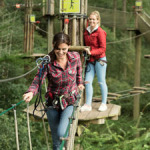 Set within beautiful forests, families and friends of all ages can unleash their inner Ape on our Tree Top Adventure and Tree Top Junior. It’s a day out like no other. 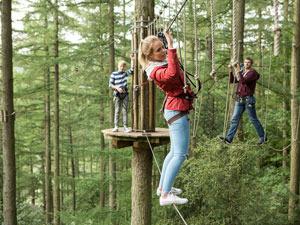 We brief you for safety before you fly down zip-wires, leap off our Tarzan Swing and tackle our obstacles whilst enjoying some of Britain’s most breathtaking scenery. Tree Top Junior is aimed at Mini Tarzans aged between 6 and 12 years old. A fun filled experience of canopy exploring, trail blazing and obstacles for all to enjoy. You’ll take on crossings over trails and finish with one awesome zip wire. Live life more adventurously – that’s our challenge to you. Start by booking your next Go Ape outing. Head into the forest for our Tree-Top Adventure. We promise you it’ll be a day out you’ll never forget!